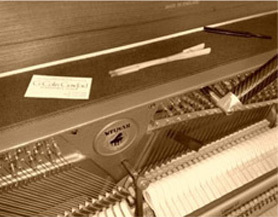 Your first choice for piano tuning, repairs and advice in Cheltenham, Gloucestershire and the Cotswold area. I commenced my training as a piano tuner-technician in the early 1980s at the London College of Furniture (now the Guildhall University) under Malcolm McKeand, (Bosendorfer UK) and the late Tom Perry (Steinway & Sons). Whilst a student I helped prepare and tune instruments in the Bosendorfer showrooms in London’s Wigmore Street. I completed City & Guilds of London Institute (CGLI) I and II level examinations in 1983 and graduated in 1985 with a Higher National Diploma in Musical Instrument Technology. My education continued with a period of working as a tuner covering the West of London for Squires of Ealing, a well-respected piano dealer, before returning to Gloucestershire to set up my own practice. I have since become a member of the Institute of Musical Instrument Technology (IMIT) and the International Association of Piano Builders and Technicians (IAPBT). I am a member of the Piano Tuners’ Association (PTA) and a former member of its executive council. In 1989 I became successor to Fred Betteridge, late of Dale, Forty & Co, who had been tuning pianos in Cheltenham and the Cotswolds since 1936. In more recent years I worked closely with the firm of Whelpdale, Maxwell and Codd Ltd, makers of the famous Welmar pianos and their Bluthners division in London, and the former Woodchester Piano Company. In order to keep up to date with progress in the latest piano developments and new models I liaise closely with a number of reputable piano dealers, importers and agents, both in the UK and in China, the new piano-building hub of the world. Over the last thirty years I have built up a solid reputation for high quality work at a very fair price, and have enjoyed a very high level of customer loyalty as a result. Much of my work is repeat business. As well as many satisfied domestic clients, I can count amongst my regular clients many internationally famous musicians, most local independent schools, the best national piano dealers, concert-hire specialists and restorers, including Steinway & Sons, Bluthner, Fazioli specialists Jaques Samuel, and the recently closed Cheltenham Piano Centre. I also undertake concert tuning, and on one occasion tuned a Bluthner Concert Grand for a concert which Herr Ingbert Bluthner himself was attending!